The Sole Secret used to come in only 2 sizes, medium and large. But what if you only have 4,5, or 6 pairs of shoes taking up useful living space, what if your entire shoe collection could fit in a box? Introducing the Sole Secret Mini. Its just like The Sole Secret, just smaller. If your entire shoe collection can fit in a box, make it a nice box with The Sole Secret Mini. 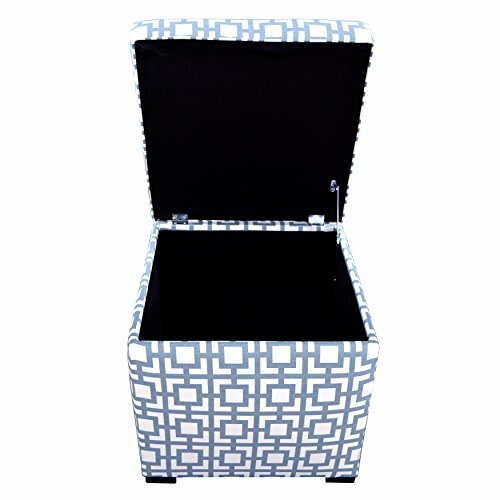 Made of 100% Cotton and upholstered by experienced craftsman, we are certain this multi functional storage ottoman would make itself right at home in your bedroom, entryway, office or living room. When you order one of these Sole Secrets you are ordering an innovative solution to keeping your shoes organized, stored and hidden from plain sight. The gigi series pattern can be described as a minimal square design with bordered and connecting squares. Turn it into a beautiful accent piece to your home decor and make it useful at the same time. - Measures 18.5" x 19" x 19"
Replace the Mess with a Masterpiece That is Proudly Built and Upholstered in the USA with Only Premium Fabric, Foam and Hardwood.